* Artist and CEO of Doodles Ave, Setria James has long been an advocate for coloring as a learning tool. As more and more studies regarding the therapeutic benefits of coloring have become released to the public, the popular brand of entertainment is seeing a resurgence in use as both kids and adults take to coloring. According to James, the act of coloring enables the mind to slow down and focus on what’s in front of them, making it easier for them to retain the knowledge being imparted. Her line of coloring and activity books, Doodles Ave, has become popular with teachers, parents, and students everywhere. While kids color they learn about the world around them in a relaxing and enjoyable way. #1 – Doodles Sunshine State Coloring Fun: Positioned between the Atlantic Ocean and the Gulf of Mexico, Florida has been shaped by its history and geographic location into an adventurer’s paradise. Doodles Sunshine State Coloring Fun features 35 vibrant images that highlight state symbols and exciting destinations, including Fort Matanzas, Ponce de Leon Inlet Lighthouse, and more. The doodles are accompanied by interesting facts, which are reinforced through interactive games and activities, such as a crossword puzzle, word search, maze, and writing prompts. #2 – Doodles Buckeye State Coloring Fun: Nestled in the Midwest, south of Lake Erie, the fourth largest lake of the five Great Lakes in North America at the foothills of the Appalachian Mountains, Ohio is home to a host of natural oases and historical sites. 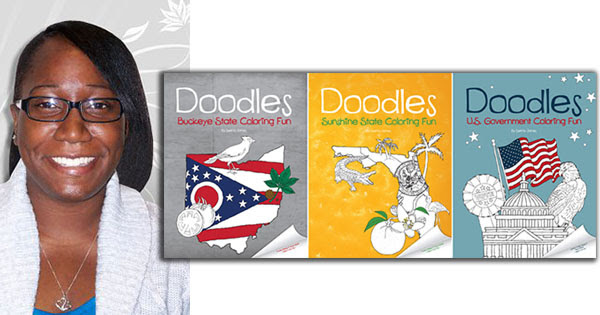 Doodles Buckeye State Coloring Fun features 35 detailed images that highlight state symbols and educational attractions, including Ulysses S. Grant’s birthplace, The Great Serpent Mound, and more. The doodles are accompanied by interesting facts, which are reinforced through interactive games and activities, such as a crossword puzzle, word search, maze, and writing prompts. #3 – Doodles U.S. Government Coloring Fun: Doodles U.S. Government Coloring Fun is designed to teach children about the functions of the three government branches and how they work together, historical laws, the levels of government, influential presidents who helped to shape the country, and symbols, songs, and structures that represent the country’s history. This book also has an activity section, which includes a word search, crossword puzzle, word creation activity, a maze, a writing prompt, and a quiz; all designed to reinforce and test lessons learned. It is ideal for citizens of all ages! James is pleased that she has been influential in helping kids to learn and explore. She is a passionate advocate for explorative education. “I began the company with the purpose of helping kids become passionate learners,” says James. “I have always believed and understood the importance of coloring for kids. James is an award-winning author of over 20 educational activity-coloring books, and a graduate of Texas Woman’s University.